Ald. Joe Moore is doing all he can to prevent the sale of the Chicago Tribune to the Koch brothers. ROGERS PARK—In a detailed letter to 49th ward residents, Ald. 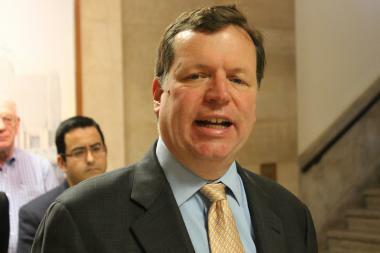 Joe Moore spelled out exactly why he voted in favor of the Mayor Rahm Emanuel's record $589 million property tax hike. "It goes without saying that voting for a budget that includes a substantial property tax increase is not politically popular, but I believe it was the right decision for the future of our city," Moore wrote. "Far too often in this day and age, our elected officials make decisions based on what is politically expedient, rather than what is right." Citing "overshadowed" enhanced city services as reasons to support the bill — like new rodent baiting crews, the promise of more police officers in the streets, a plan to turn some school health clinics into community clinics, increased youth services and more resources for people living with HIV/AIDS — Moore said none of those benefits would come at a cost to taxpayers. In terms of the massive property tax increase, Moore said it realistically put the city on a "path to fiscal stability" and made continued investments in the city. He said the city's $12 billion deficit to its pension liabilities has already downgraded the city's financial rating to a "junk" status, and Moore worried that without passing the bill, Chicago would spiral into even further fiscal turmoil. He called approving the city's budget the "only viable option" for meeting their legal requirement to pay back $544 million to police and fire retirement funds. "If the city failed to make good on its legal obligation, the city's already shaky credit rating would be downgraded even further and the long-term retirement security of our first responders would be jeopardized," Moore said. He said he also was dissuaded by the $9.50 per month garbage collection fee that applies to buildings with five or less units, saying at least 80 percent of his ward already paid for private garbage pick-up through their rent or condo association fees and that there was a 50 percent discount for seniors. Rather than feeling "nickel and dimed" over the fee, Moore said residents can "now be treated equally." The Rogers Park alderman also acknowledged that while he felt the need to support the mayor's bill, he realized the difficulty moderate and low-income homeowners will face "absorbing" the fees. To help, he said he supports Emanuel's efforts to double the state homeowner's exemption from $7,000 to $14,000 "to ensure that the property tax burden is borne by those who can best afford it." That move would require a change in state law, but Moore said his "backup plan" if that fails he also supports Ald. Joe Moreno's plan for a rebate to middle and low-income homeowners. Ultimately, Moore said without passage of the bill, the city would further sink into financial insolvency and people would pay the price with fewer first responders and a worthless state credit rating. He also quipped that though the property tax increase was unpleasant, his colleagues who voted against it failed to offer up alternatives. "Significantly, not one of those who opposed the budget has offered a viable alternative. Not one," he said. "In passing this budget, we confronted our fiscal challenges head on rather than passing them on to next generation. As a result, Chicago will regain its financial footing and become a stronger more prosperous city."